The pipes in your home won't last forever - much as your budget may wish they would! Over time, the piping can gradually corrode, rust, or decay. Unless you replace the plumbing, you will eventually experience leaks. Or if you're extremely unlucky, raw sewage or a flood of water can come into your home, causing thousands of dollars worth of damage. How can you tell if a plumbing disaster is close, or something to worry for the future? Replacing pipes in the average home requires cutting open both floors and walls, and costs range from $4000 to $10,000, so it is not a job you want to do if it is not necessary. There are a few ways that you and your plumber can assess whether it’s time for replacement or not. 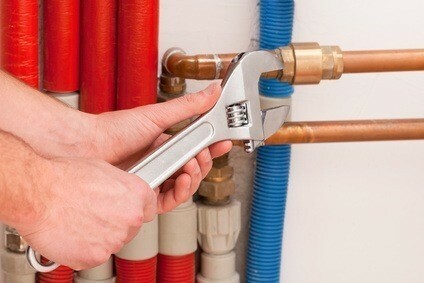 Knowing what kind of plumbing your home has will give you a time frame for how long the life expectancy is. Reviewing the home inspection report from when you bought your home, or bringing a plumber in to check your system, will help you identify this information. No matter what kind of pipes you have, and how old they are, you should always keep an eye on them. Lead and polybutylene pipes are two forms of water supply pipe that, regardless of age, should be removed immediately. Lead pipes have about a 100 year lifespan, but are a health hazard. Lead can leak into your water supply, poisoning you and your family. Polybutylene pipes are prone to breakage, more so than any other type used. Signs of trouble include discoloration, stains, flaking, or dimples, which all indicate corrosion. You can see this on the visible portion of pipes such as the ones in your attic, basement, or utility room. If any of these are spotted, your first step should be to bring in a plumber to do an inspection. While a whole home re-plumb may sound drastic, it can save you from a disaster, and will last you many years to come. If you are looking redo the plumbing in your home, please call us at (352) 817-7647 or use our online service request form to reach out to us.